Cruising with Pride is excited to feature the most comprehensive selection of all-gay cruises and resorts. We also offer some of the best all gay Inclusive Resort options like our popular Club Atlantis Cancun trip and Club Atlantis Vallarta! Hong Kong, Taiwan, Shanghai, and JAPAN! Atlantis returns to Asia in a big way in 2019 with an all-new, all-gay cruise from Hong Kong to Tokyo. In 10 magical nights, you'll explore four of the world's most vibrant cities, discover Japan's most thrilling sights, and immerse yourself in fascinating cultural experiences. Onboard the magnificent Norwegian Jewel, you'll sail in style on one of the most popular ships we've ever sailed! Departing from Hong Kong, with two days in Taipei, Taiwan; two days in Shanghai, China; then stopping in Kochi, Osaka, and Shimizu before docking in Yokohama, Japan (Tokyo). 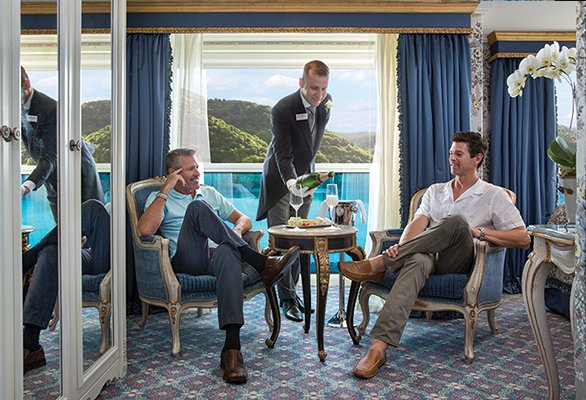 Join the granddaddy of gay cruises, RSVP, as they take over Holland America's Oosterdam! Sailing round-trip from Seattle, visiting Juneau, Sitka, Ketchikan, and Victoria, BC. I've been to Alaska on 7 cruises and it's the most amazing experience. Eagles and Orcas and Bears, oh, my! Sail the beautiful, Celebrity Summit roundtrip from the Big Apple to one of the most fun gay parties on the planet... Provincetown Carnival! Leave Port Liberty, NJ (across from Manhattan), enjoy Saint John, New Brunswick, Canada; Bar Harbor, ME; Provincetown, MA (overnight) and two full days at sea to enjoy the amazing ship and on board entertainment. Drink packages will be available! Join Source Events discovering the magic and mythology of the Greek Isles - one of the most storied regions of the world - on a private all-gay voyage of the beautiful tall ship, Star Flyer. Sailing round-trip from Athens, you'll visit Milos, Santorini, Bodrum (Turkey), Mykonos (overnight), Sifnos and Spetses. "R" Family Vacations "Out on the Danube"
Sailing with "U" by Uniworld, join our LGBT family and friends for a full ship charter, from Munich (cruise departs nearby Regensburg), visiting Passau, Linz, Melk, Wachau Valley, Durnstein, Vienna (overnight), Bratislava and ending in Budapest. Featuring LGBT comedy and music, dance parties, theme parties, complimentary WiFi, Gratuities and OPEN BAR! Join Brand "g" for an inclusive, all LGBT, 13-day journey, exploring the splendors of India and cruising the Lower Ganges River. Begin your journey with two magical nights in Munich, including a tour to Neuschwanstein Castle and more. Then enjoy an all inclusive Danube River Cruise on the Amadeus Star, from Nuremberg to Vienna, stopping at beautiful story book villages, with Castles, Palaces and Christmas, oh, my! Complimentary drinks throughout the cruise, amazing cuisine and complimentary shore excursions. (per person, plus taxes and tips of $335 each. All-Inclusive Cruises on Emerald Star-Ship with all drinks, meals, tours, entertainment and more ALL INCLUDED FOR ONE PRICE! 13-day all-inclusive Peruvian adventure including an Amazon River cruise and culminating with a comprehensive Machu Picchu experience. Check out the fantastic ship here. One of Europe's most legendary rivers awaits you on this exciting journey along the Rhine River, which begins in Switzerland and stops in France, Germany, and Holland! Includes 2 night hotel in Switzerland, full day tour to Lucerne, 7 night cruise w/open bar, transfers,more. 7-night deluxe Danube riverboat cruise on the Amadeus Queen, featuring 2 pre-cruise nights in Prague. Includes 1/2 day guided walking tour of Prague, open bar on the cruise, shore excursions daily, two days in Vienna, transfers, more. Email Tom@Cruisingwithpride.com for full details. Sail the beautiful new 5 star "Le Jacques Cartier"
184 guest ship, round-trip from Reykjavik, visiting glaciers, lava fields, geysers, and steam baths. All-inclusive from . Call or email Tom@Cruisingwithpride.com for full details and to make your reservation. Starting with two nights in Paris, a private Seine river cruise, then transfer by TGV to Lyon for a 7 night deluxe cruise on the amazing Amadeus Provence w/open bar, free wifi, more. Join this deluxe 13 day journey of a lifetime, with 3 nights hotel in Siem Riep with visit to Angkor Wat and lots more, 7 night luxury cruise on the lovely Mekong Jewel with open bar, dinner wine, shore excursions, and then 2 nights in Ho Chi Minh City for more adventure. Club Med Cancun is taken over for an all gay, all inclusive, all fun week on a lucious white sand beach in Canun. At Club Atlantis, absolutely everything is included - accommodations, all meals, sports, activities, entertainment, parties, gratuities, and even drinks at the bars. It's truly the best value in all-gay vacations anywhere. (Club Med fee $35 add'l. Optional transfers $42 p/p extra). A truly all inclusive experience! Enjoy seven unique, elevated, fine dining restaurants and bars, included Tours of Chichen Itza & Swim with Dolphins, and more, included spa treatments (just pay 20% service charge), and Vacaya's unique T-dances, Sunset Socials, and Halloween Costume Extravaganza & Day of the Dead celebrations. Cruising With Pride offers you all the best in Women's travel. Traveling with other women like yourself is a great way to experience new cultures and adventures. Please check out the links below for the latest the lesbian world has to offer.Please come back to us to make your reservations, though! It doesn't cost you any more, and it helps us to stay in business so we can continue to offer you the most in gay and lesbian travel. Thanks! From their humble beginnings as a women’s music label 36 years ago, to their last 20 years as the leader in lesbian cruises and resort vacations, Olivia has always been about creating a space for YOU to feel free. That’s why they charter the whole ship, or buy out the whole resort, then fill it with women! R Family Vacations was created by Rosie O'Donnel's partner, with gays and lesbians, their friends, and families in mind. They promise you'll enjoy the best in both gay and lesbian entertainers. This is the all-gay cruise that you can take your parents!R Family cruises are a home away from home where you can relax with your partner, your children, your nieces, nephews, grandchildren, parents, or friends. It's "R Family" and that means a place where everyone is finally welcome. 60% lesbian on these!! !Browse their current packages at www.rfamilyvacations.comAll the above prices are per person based on double occupancy and, unless otherwise noted, do not include taxes and tips. Prices and availability are subject to change. Single shares available. Prices current as of April 1, 2019. Remember, Cruising With Pride doesn't charge a fee for helping you with your all gay cruise. A note about lesbian travelers: These cruises are predominantly male but women are most always welcome (as are your straight family and friends). The percentage of women is usually about 5% on the large ship cruises, but, sometimes no women at all on the smaller sailings. For all women travel check out the section above.